New growth may be sprouting up on Pacific’s Forest Grove campus. For her senior project, Sierra McCartney is trying to get a landscape design implemented on campus. The sustainable design and art double major decided that she wanted to combine her two interests, sustainability and art, into one project. She said that for her art major, she’d historically created art that was replicating other art, but since the process no longer carried a meaning for her and she wanted her art to be something that encourages people to see things differently. She chose a site behind the Pacific University library with the hope that, using both artistic and sustainable practices, she can get people to see the site differently. 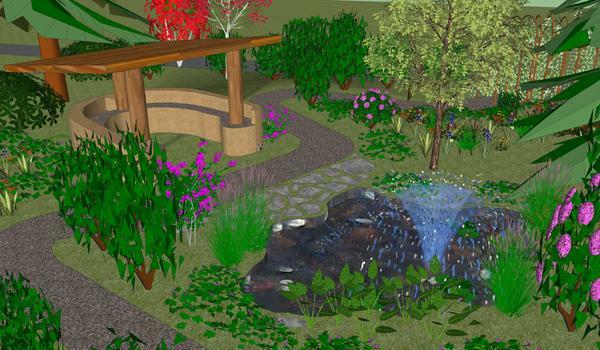 McCartney said that she started designing the garden with the intent to demonstrate sustainable practices and inspire people to practice more environmentally friendly methods in their own lives. She said that she chose a garden because she feels that landscaping at Pacific is a big problem. “There’s a big focus on the buildings,” said McCartney, who explained that while it’s important to have LEED certified buildings, she thinks that the landscaping at Pacific has been forgotten. She said that irrigation is a problem for the lawns and is killing the campus oak trees. McCartney explained that the overwatering can make the trees start to grow fungus, rot and die. She suggests that rather than “dumping all that water” on the lawn, the university should plant native species instead that are in tuned with the seasons. She said that doing so would create more plant diversity and attract a greater variety of wildlife to campus. For her own garden, McCartney said that using local materials and natural materials was a big priority for her because she said that she wanted humans and nature to coexist in the same space. She wants to grow edible plants such as blueberries, red currant, bunchberry, beach strawberries and trees such as dwarf apple, pear, plum and hazelnut. While McCartney is not lacking for enthusiasm for her project, she has been running into a few challenges to get her design in the ground. Director of Facilities and Safety Management Harold Roark said that he isn’t opposed to the concept of the design, but that the project needs more work before he can approve it including specifics for what it will look like, who’s going to pay for it and who’s going to maintain it. Roark said that he’s concerned that the extra work to maintain the garden would become the responsibility of maintenance and facilities rather than students. Fruit that isn’t eaten from the fruit trees falls to the ground and eventually rots which isn’t esthetically pleasing or sanitary. Roark said that many of the plants existing on campus have been specifically chosen because they are easier to care for. “Having a garden on campus is all well and good, but someone has to maintain it, it has to be beautiful,” said Roark who’s standards for the project will be focused highly on cost and beauty as per the requirements of the university. In addition to being beautiful and well maintained, Roark said that safety is another concern of his when weighing in on the design. The garden would need to have open spaces and short hedges because people can hide in bushes or tall shrubberies and potentially ambush students. Roark said that McCartney’s proposal isn’t the first on-campus garden idea Pacific has seen. He said that a garden project was placed in Trombley Square between Scott Hall and the Library and fruit trees were planted between Clark and McCormick Hall in 2006, but the projects were unsuccessful. According to Roark, the garden in Trombley was not maintained and eventually was removed. The fruit trees, in addition to not being maintained, were vandalized and had their branched stripped from them. As a result, the trees were also removed. Roark said that it’s uncertain whether the trees were vandalized by Pacific students or by residents of Forest Grove. Also, while McCartney said that she would like to see less watering of the lawns, Roark said he thinks that that the proposal is impractical for Pacific. If the lawns aren’t watered during the summer, the grass turns dries up and turns brown. He’s concerned that if maintenance stops watering and the proposed garden goes unmaintained, when parents bring their student, or potential student, they’re going to see dead grass or an overgrown garden. “I’m not willing to let that happen yet,” said Roark. McCartney, however, said that beautification and maintenance were strong considerations when designing the garden. She said while she was planning the garden, she considered when the plants she wanted to implement would bloom to ensure that something would be blooming during each season. “I wanted to show that this can be beautiful,” said McCartney. Another obstacle that stands in the way of the garden is that the site conflicts with the intended location of President Lesley Hallick’s proposed science complex. The science complex, which is being fundraised as part of the Pacific University capital campaign, is intended to be a building that unites the undergraduate science programs and provides more departmental facilities. The projected site for the building is behind the library, near Murdock Hall, the same location that McCartney wants to implement her garden. Roark said that even if the garden was approved for it’s current location, he would be forced to take it out in a few years for the construction of the new complex, but that he would be reluctant to approve the garden for that reason. McCartney said she hadn’t been aware of the complex when planning her design and, because she made her design for that specific space, she doesn’t know where else on campus it would go if the site is not approved. She said that the unexpected delays were becoming quite stressful and she wasn’t sure she’d even have time to complete the project if it becomes approved. One of the most stressful concerns for McCartney is that the implementation side of the garden is supposed to be her art senior capstone. If her design isn’t given the go ahead soon, she said her backup plan would be to focus her attention on the Life and Sol Garden which is located on University Avenue across from the tennis courts. “I could do some of the things I was going to do on site, like my cob bench, I could do that [at Life and Sol], but it would make me incredibly sad if I had to do that,” said McCartney, who emphasized the importance of having the design on campus. While she said she would be tremendously disappointed if her project isn’t approved, McCartney explained that the process has still been a huge asset to her education. She said that the project had changed drastically since it’s initial stages and going through the motions of trying to get it approved had taught her a lot. “It makes me feel like maybe after school I could start my own thing and not have to go to graduate school, but if I hadn’t done this project, I wouldn’t be feeling like that at all,” said McCartney. While Roark said that he would be in favor McCartney’s garden with some alterations and added specifics, his idea of sustainability extends farther. “I’ve been working at the sustainable process longer than some of these students have been alive,” said Roark. A few of Roark’s ideas have been implemented on campus to both increase sustainability and also save the university money. One of his contributions includes computer-controlled sprinklers that water the lawns when they need it, but conserve water when it rains. Another addition includes the purchase of a cardboard baler. Before the baler, the university needed to pay $600 a month to dump cardboard, but the baler compacts the cardboard, which can then be sold for $10 a bale. The savings covered the cost of the machine within a year and now is saving the university money and is keeping all that cardboard that would have been dumped out of landfills. Roark confirmed that overwatering was causing a fungus that’s killing the white oak trees on campus, but he’s implementing a solution of his own to address the problem. According to Roark, the white oaks, while native to Oregon, did not grow naturally on campus, but were planted there. As the white oaks rot and need to be cut down, Roark makes sure that between three and four times as many trees are being planted for each tree that needs to be removed, but rather than planting white oaks, he plants red oak which are immune to the fungus which is killing off the white oak. If possible, Roark sees to it that the tree is pruned enough to not be a safety hazard, as rotted branches can fall and injure people, but that the base is left intact to remain habitat for wildlife such as squirrels and acorn woodpeckers. Roark said that while many of the trees he’s planted are small and young now, his vision for the campus extends far into the future for when they’re full and grown. He said that while the students now might not be around to see the trees as adults, maybe their grandchildren will. Roark said that he likes to think of sustainability in a big picture scenario and next would like to see solar panels placed on the Forest Grove campus.